I’m just going to share what we did with some good old fashioned bullet points. Here we go! Buy a WHOLE BUNCH of cloth towels that are good at drying. I like lightweight cloth towels better than terry cloth. Flour sack towels are my favorite to use in the kitchen. In addition to the flour sack towels I already own (you can buy those pretty much anywhere these days, by the way), I also purchased the Tekla and Elly dish towels from Ikea, which were $0.79 – $1.00 per towel. (FYI: I like the fabric used for the Tekla towels a little better, they have a little hook for hanging and they’re cheaper.) I am also planning to buy a few of these Bird-E Towels on Etsy (thanks to reader Sara B. for that suggestion!). Store the towels all together in a VERY accessible spot in your kitchen. I bought a bin to keep all the towels in and we keep the bin in a drawer in the middle of our kitchen, one that all of the kids can easily reach. 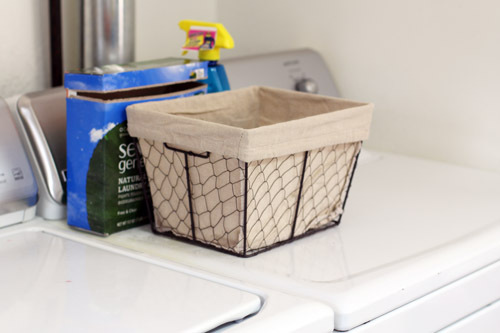 Get a small basket to set in the laundry area for soiled towels and cloth napkins. I bought a cute basket to set on our dryer and that’s where all the dirty (dry) towels and cloth napkins go. Hang hooks in the laundry or kitchen area. I found wall hooks that say “LAUNDRY” at World Market, but any hooks will do! After we’ve used one of the towels, if it’s too wet to throw into the laundry basket we hang it on a hook. Luckily for me my laundry area is right next to the kitchen, so the hooks hang above the washing machine. 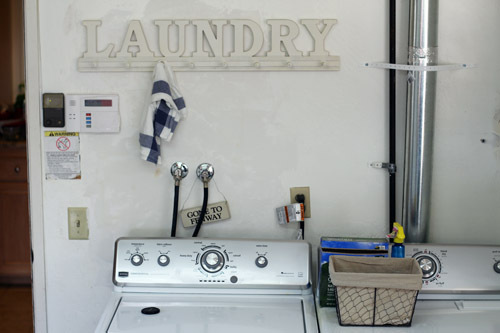 If your laundry room isn’t close to the kitchen, find a good spot in your kitchen to place the hooks. The key is that they need to be accessible! The key to successfully getting rid of paper towels and paper napkins is making the cloth versions accessible and easy to grab. It’s so simple but it took me a while to figure it out! Now that we have our system in place, everyone is using cloth with no issues whatsoever. My kids know where everything is and what to do with dirty towels and napkins. Every time I see one of the towels hanging to dry above the washing machine it makes me so happy! Some great tips. I need to get that little laundry basket. 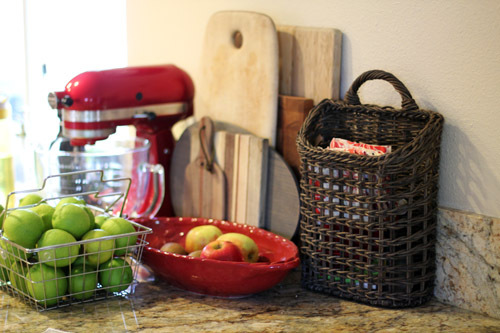 I LOVE that brown basket in the last pic. Please tell me where you got it? (I am a basket collecting freak). You’ve got me thinking that I would like to try adopting some of these ideas too! 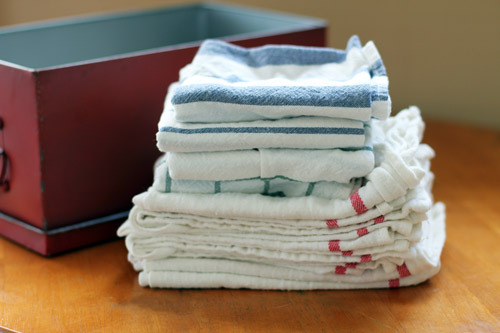 For big messes, we use white “bar towels”…cotton blend, more substantial & hold up to bleach better. Or Food Lion sells reusable bamboo cloths – this is what we always used with the babies! Now retraining the grandparents has been tougher! GREAT tips, ashlyb! Thank you! I have one question about the paper towels…how do you wipe up grease from seasoning your cast iron pan and also draining bacon after cooking? Those are the only things I really use paper towels for, but can’t figure out how to do without? Hi Sara! That’s a GREAT question. That is actually one of the thing I’m saving just a few paper towel rolls in the garage for. Although, I’m also thinking this may be the system I come up with – drain the oil into a can to dispose of, and then have one cloth dedicated to wiping out the pan, and then rinsing that cloth well under hot water before throwing in the wash. Honestly, paper towels haven’t always been around, so I’m trying to think of what my grandmother and great-grandmother would have done! I cut up my children’s stained, old clothing that I cannot pass on for the greasy messes that happen. I keep the rags under the sink. loved your article. We are trying to cut back too. The switch to cloth napkins has been wonderful. How would you clean up cat puke, if you didn’t have paper towels. LOL but seriously. Well maybe as the kitchen towels get worn they become car clean up and other clean up towels. I would mark them in someway to make it obvious they are not to be used in kitchen . I like what cindy said below – this may be a paper towel-worthy emergency! 😉 but I also like K’s suggestion! I use stale bread to soak up gross grease and also for other wet food as we don’t have a garbage disposal. And I use brown grocery bags for grease too. Peggy, I would consider cat puke an emergency worthy of paper towels! If you still get a newspaper that would be a good alternative. We have been off paper towel with the exception of grease (and those I compost) for years. After cloth diapering was done I had some wet bags that hung on door nobs that I realized we’re the perfect place to store dirty kitchen towls and napkins. We hang it on the kitchen door leading to the basement and when it’s full I just dump it all in the wash like I would have the diapers. Since our laundry is downstairs this works better than a basket and handles messy wet rags and uses less water for rinsing. thanks so much for sharing your system – so helpful! I’ve been working on using less paper towel for a few months, just trying to get family on board is a challenge. I never thought about using cloth napkins, thanks for tip. Hey Jane! We are doing this as well and I’m just wondering what you use for cleaning the bathroom, in particular the toilet and floor? I use rags for everything else but can’t bring myself to using something not disposable for the toilet and floor. Suggestions?? Great post! Look for our link share! I have stocked up on towels and cloth napkins, with 3 rolls of paper towels to go. Do you rotate towels every day? How do you prevent grease stains on the towels and napkins (pre-treat with…?)? so, I have my towels that I use as my kitchen towels (drying dishes, hands, etc) that hang on the oven – I change those out once or twice a week – I’ve always had those. for the big stack of towels I’ve gotten to replace the paper towels, we just use them as needed, then either throw them in the laundry or hang on a hook. You could re-use them if not too dirty, but I have so many I’m just using them basically once. I”m always doing laundry and they just go in with whatever loads I’ve got going, so they get rotated through the wash regularly. ok am i an idiot but did you get rid of the weekly menus ? when i go to the home page i see a menu from jan 18 ? but i see you are still posting tips here from time to time ?